Your complete web-based source for jack selection and engineering data. 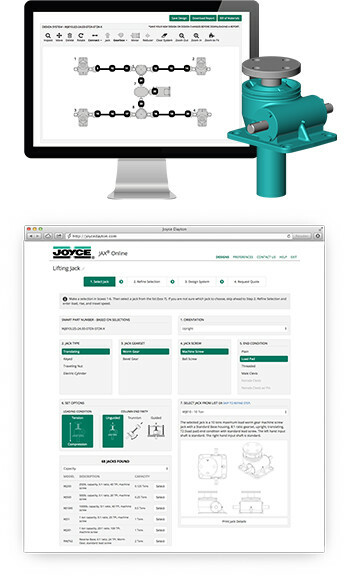 Our easy-to-use JAX® Online software enables you to specify the right jacks and components for your ideal lifting and linear motion systems. You can start with a complete set of requirements, or just a few simple inputs, and let JAX Online suggest the perfect components. The detailed reports created are complete and ideal for inclusion in technical project files, saving you time and minimizing headaches. JAX Online is just one more example of how Joyce/Dayton is committed to providing designers and engineers with the tools they need to succeed. JAX Online tool is easy to use – see for yourself!